A detailed, annotated solution to the cipher based on the Hardens’ worksheets. The annotations link to notes containing many observations about the various errors and other interesting information gained directly from the Hardens’ worksheets. Mistaking for , resulting in initially deciphering MUCH as MUDH. Thinking that and were the same symbol. Thinking that , which decodes to “A” and “S”, also decodes to “N”. At one point, the Hardens thought decodes to “Y”. But it actually decodes to “M”. Reprints of the solution in the Chronicle and the VPD report use the word “HONGERTUE” instead of “DANGEROUS”. I couldn’t tell where that mistake originated. The Hardens mistook a for , initially causing the word “OFF” to decode as “OFE”. The Hardens must have been confused about vs. , causing the word “TRY” to decode as “TRS”. He mixed up triangle-shaped symbols , , and   . I think these were unintentional transcription errors on his part, but he could have done them on purpose to try to confound code breakers. The word “DANGEROUS” decodes to “DANGERTUE” unless you replace the symbols with the similar-looking symbols . The word “THAT” decodes to “THAE” unless you replace with . 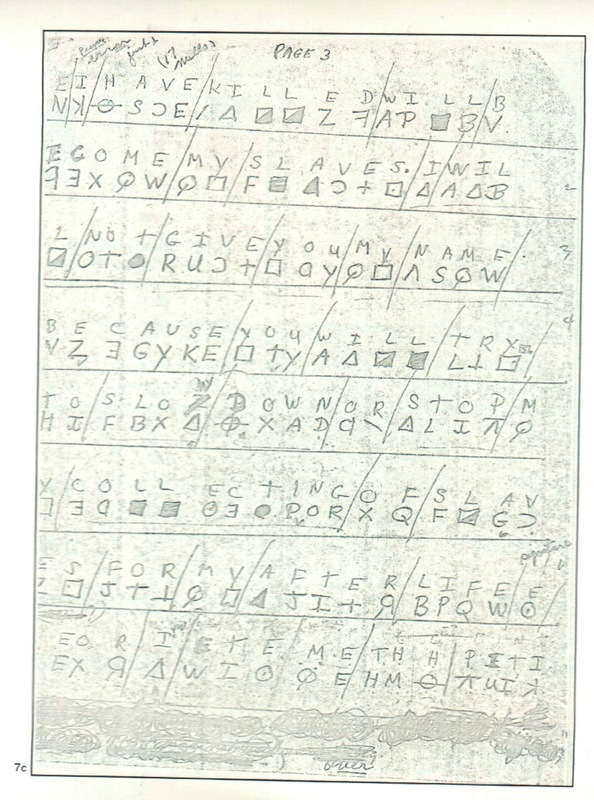 Maybe when transcribing the final version of the cipher, Zodiac thought looked like . He left out a word somewhere in the transition between Part 2 and Part 3 of the cipher text. His key says decodes to N and W, but it only decodes to W in the Hardens’ solution. Did the concerned citizen confuse for , which decodes to N? His key says decodes to L and T, but there is no known reason that L should be included. He does not notice the one time decodes to A instead of S.
He combines and into a single symbol: . He maps this to F and M, which makes sense, but mysteriously includes K and L as well. Why? His key mistakes for . Zodiac’s symbol for A appears, seemingly by error, as S and S as A. More dust in the solver’s eyes! There is no mistake there. He was trying to confuse the decipherer and he did. Ephron might be right, but the symbols in error are all triangle-shaped, suggesting that they could easily be confused for each other when hastily transcribing the ciphers from an earlier draft. 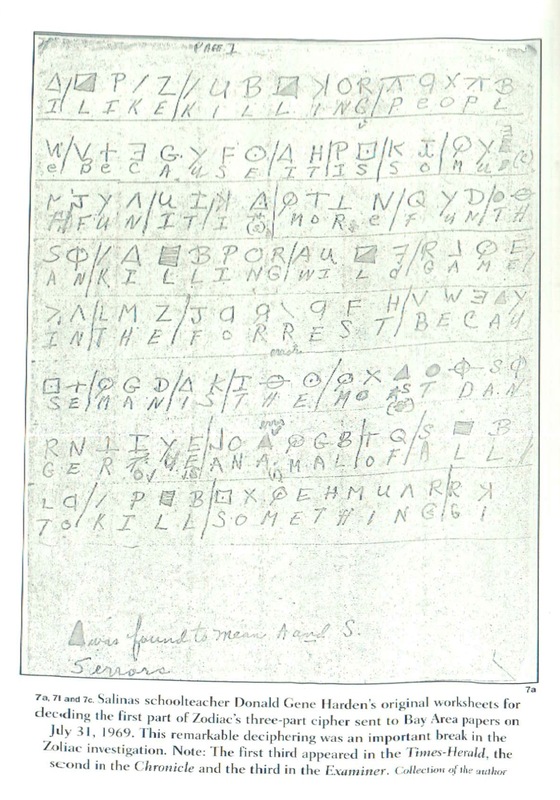 Ephron explained that repetitions of symbols, digraphs, and longer groups are the means by which ciphers are solved: “On the basis of frequency the value L should have had only two symbols, but because of the frequency of Ls in his message, he switched after the encipherment was begun to using the square both half-black and fully black, thus giving himself another symbol for L and for greater variety in the double L’s he gave up the alternation regularity. But my first discovery on analysis was the identity of the two squares and B (all the symbols for L.). 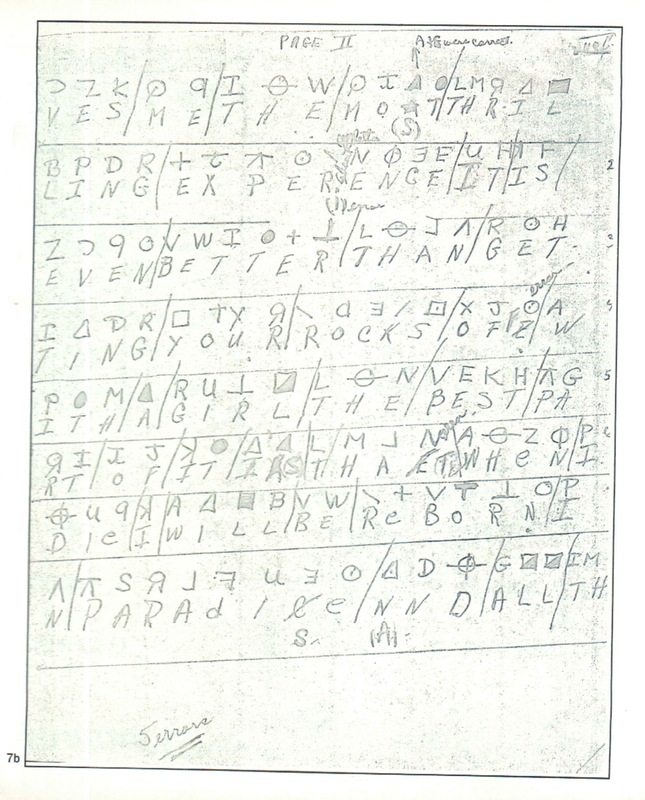 Despite the interrupted cycle pattern, Zodiac did not do a good job of hiding the appearances of LL in his message, because the pattern appears six times in the cipher text. At the very beginning, a word is missing. Homophone cycles for E, F, I, N, O, R, S and T are interrupted. Does a relationship exist between the missing word, last 18 symbols, and broken homophone cycles? If we restored the symbols for the missing word (or maybe it’s an entirely missing sentence), would the cycles be improved? Can the cycles be improved if some transformation is done to the last 18 symbols? So, as usual, I leave this exercise with more questions than answers! What did Harden erase above the last 18 symbols? Did Zodiac leave out a single word, or a longer phrase? What was it? 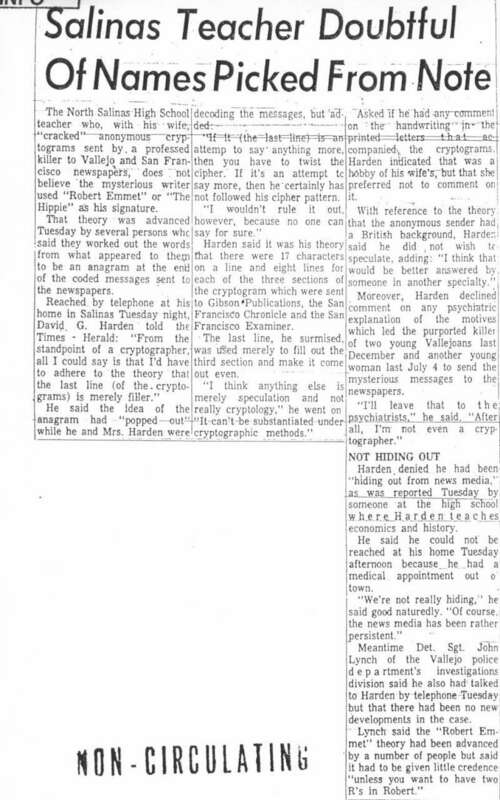 The decoding of DANGEROUS as HONGERTUE was reported by the SF Chronicle and Vallejo PD. Where did this mistake originate? The Harden worksheet in the Chronicle article is different from the ones that appeared in the Graysmith book. Which worksheet came first? Is it possible to obtain the rest of the worksheets that were used for the Chronicle article? Who was the Concerned Citizen? What is the explanation for the oddities in his key? I’ll leave that to the psychiatrists. After all, I’m not even a cryptographer. ← Who is the “Concerned Citizen”?